I have to confess that despite having volunteered to help with the recipe testing before publication, I am probably the worst recipe tester in the world. But, Karen’s new book is actually something that works even for someone like me. I made and loved a yellow lentil soup with lemon that is in the book as part of the testing process and also tried an easy chicken doner kebab. I’ve already made the yellow lentil soup several times since and love the way that the lemon lifts the dish while the lentils provide a filling comfort meal. I suspect I’ll be making Coronation chicken again too because it’s such a good way to make something different with poultry. There are a couple of theories about the origin of Coronation chicken. It was part of a menu devised by the Cordon Bleu cookery school for the Coronation of Queen Elizabeth II. It was originally credited to Rosemary Hume and Constance Spry who were both principals of the Cordon Bleu Cookery School in London at the time. You can find the recipe that was used on the Cordon Bleu website – it’s actually quite complicated and involves red wine, apricot puree and whipped cream. It was partly governed by what would have been available in post-war Britain – so for example, there’s curry powder rather than individual spices and a sauce that didn’t rely on mayonnaise. Subsequently, it’s been suggested that the recipe was actually a variation on a dish prepared for the silver jubilee of George V in 1935. And, more recently, Heston Blumenthal created ‘Diamond Jubilee Chicken’ which is similar to the original recipe but involves making your own spice mixture rather than using curry powder and brining the chicken in spices and with golden syrup for sweetness before grilling it. Far more accessible is Karen’s version of coronation chicken, which for the most part uses ingredients I already have in my store-cupboard. She recommends using curry paste and uses reduced-fat mayonnaise and half fat creme fraiche to create a much lighter and healthier coronation chicken than the version you’ll find in most supermarket sandwiches. And, for me, the real advantage of making up my own healthy coronation chicken is that I can adjust the ingredients very easily to my own taste. I also have to confess I made my own version using a left-over chicken breast from the Sunday roast, rather than following Karen’s suggestion and poaching the breasts in stock. I do think it works very well as a way of using up leftover poultry – it’s a great way to use up leftover turkey too. Karen’s coronation chicken recipe uses a mild red onion chutney in addition to chunky mango chutney. I know when my mother made her own version of coronation chicken it involved apricot jam and canned apricots – mostly because the only time we used canned apricots was for coronation chicken. The red-onion chutney is a spicier, less sweet alternative and I rather like it, although I did cut the quantity recommended down a lot I suspect that may be down to variations in the brand. What I’d suggest is tasting as you go and adding the mango chutney first when you make this healthy coronation chicken recipe. Mix together the creme fraiche and mayonnaise, then stir through the lemon juice to loosen it. Add the diced chicken and fold through till all the pieces are coated. 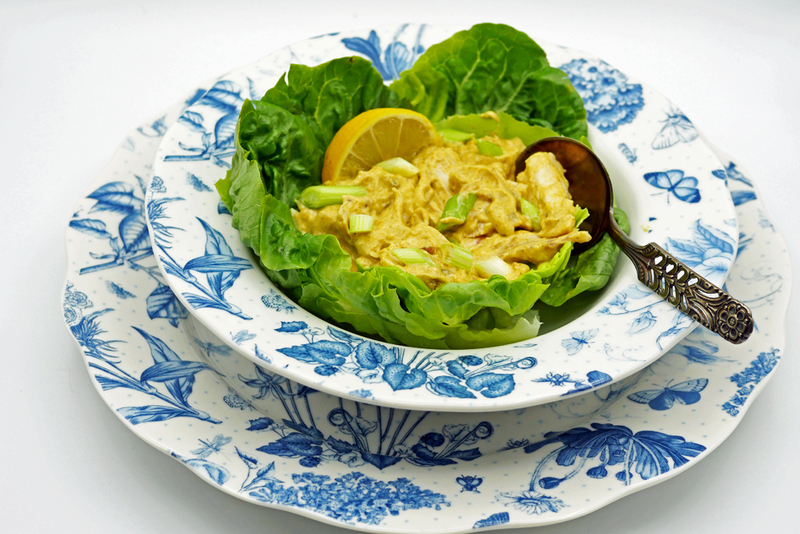 What I like about this recipe for a healthier coronation chicken, as with many of the ideas in Karen’s book, is that I can easily see how I can adjust them to make them my own. I might consider adding sultanas and fresh mango to the base coronation chicken mixture and I would be curious to try making up my own spice mixture rather than using curry paste. I also think it would probably work made with no mayonnaise at all and a mixture of creme fraiche and Greek yoghurt, with caramelised red onions (rather than chutney) and fresh mango for a really light dish. So I will be experimenting. And, what I like best about Karen’s book is that it really is about her. It’s the kind of book which even if you’ve never met her, by the time you’ve browsed through to the end you will know her. It’s the kind of book that I have propping up my bedside table. 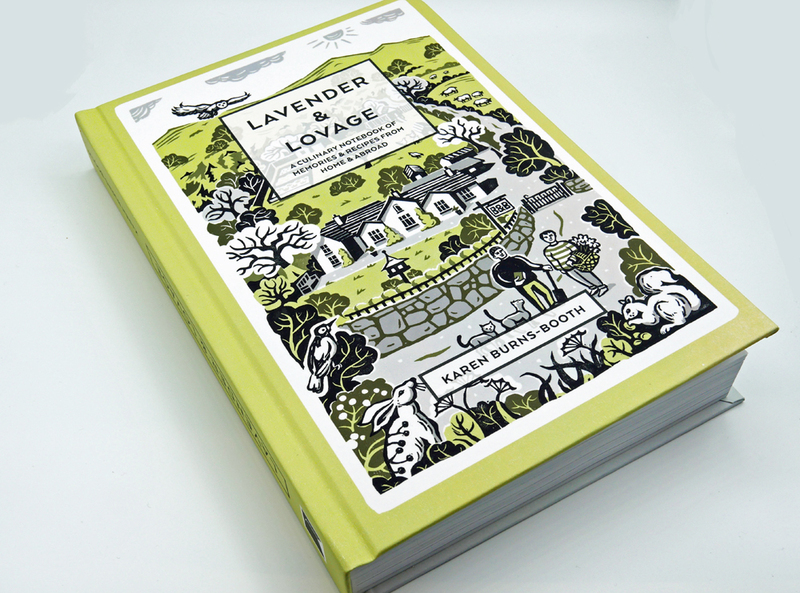 I’m not very good at following recipes but I do enjoy reading them, especially when, as is the case with Lavender and Lovage the recipes themselves are accompanied by snippets of life. The context makes the whole thing far more meaningful for me. 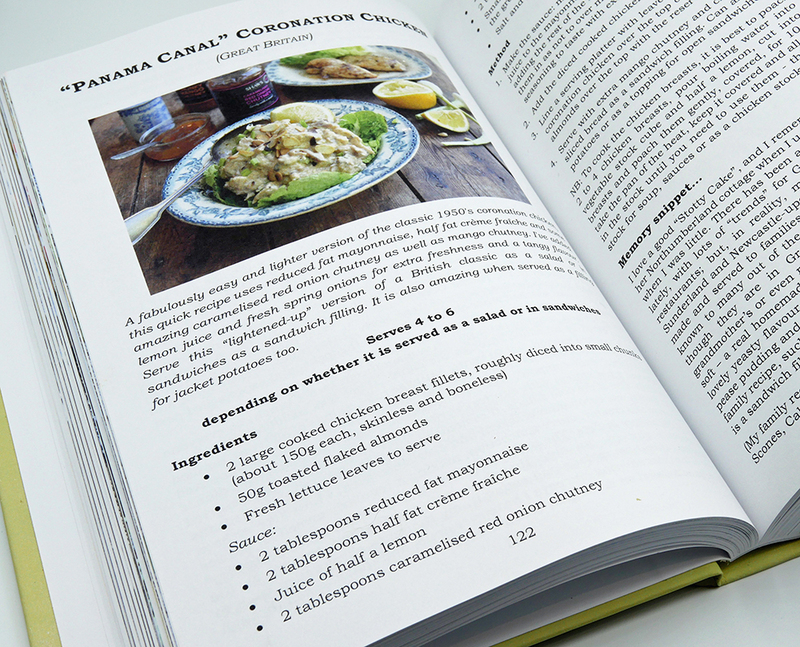 I’m thrilled to say that Karen has offered one book as a prize for a lucky London-Unattached reader – you just need to follow the rafflecopter through as normal and let me know, in the comments below what you’d serve with this healthy coronation chicken recipe. We’re having a get-together of family and friends over Christmas and this would be ideal I think. 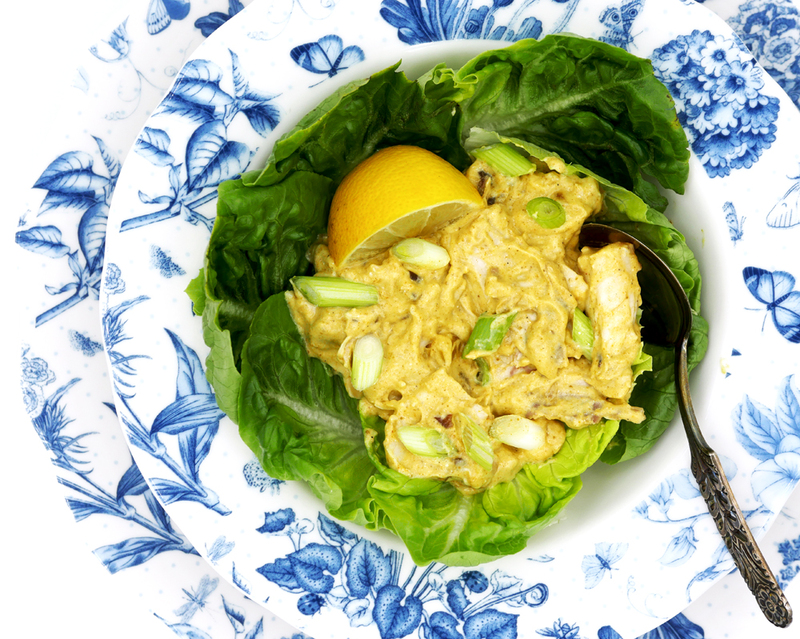 This coronation chicken would be great for lunchtime. It looks yummy.